This file is a Addon for JRR Skins collection - A tribute to middle earth by Adra. You must have that installed before this Addon will work. This addon features two themes, each one consists of a compact toolbar integrated in JRR's main theme. The featured grey toolbar is a revival of the GreySkin UI's toolbar. The black edition is a JRR bonus. - Step 1 : Download the file, then unpack it on your desktop. 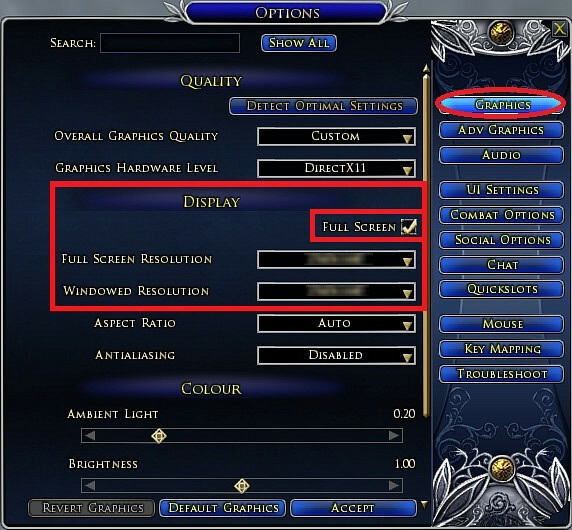 - Step 2 : Do you know your LOTRO client's display resolution ? If you play in window mode, note your corresponding resolution. within sub folders called _Black toolbar and _Grey Toolbar. There is 1 skindefinition.xml per folder. Don't panic ! You'll just have to modify 2 numbers near the beginning of the text The needed explanations about how to proceed are logged into the skindefinition.xml file. - Step 4 : Your skindefinition.xml files are set for your own resolution. 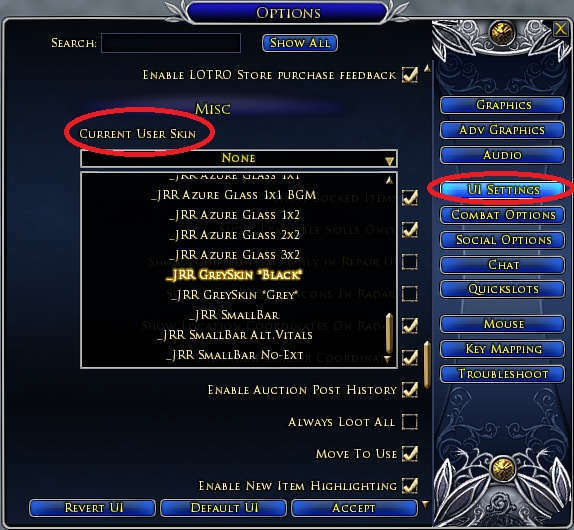 Copy the "JRR addon - GreySkin" folder in your "my documents" --> "The Lord of the Rings Online" (this is where your LOTRO screenshots are located) --> "ui" (not in capitals) --> "skins" (plural), create these sub-folder if they don't already exist. Log on the character onto you want to apply the _JRR GreySkin *Grey* or the _JRR GreySkin *Black* profile. Select the theme from the panel menu --> UI Settings, as shown on the picture below. logout (character selection menu) then come back into the game. Converting this add-on into a standalone release, a child's play ! To enjoy this release of GreySkin, you first need to download and install JRR Skins collection, then the GreySkin file available for download on this page. But if you think "I just want to use GreySkin, I don't care the JRR other skins, I don't want to waste some space on my hard disk with all that crap..."
I answer you "There's no problem !" Indeed, each JRR skin is built as an add-on, so the whole JRR pack is modular ! 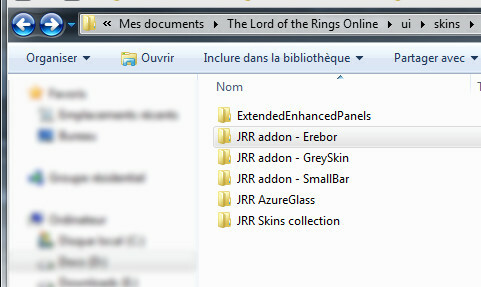 - Once JRR main pack and the GreySkin addon are installed on your computer, open the "JRR Skins collection" folder, it is located there : "...Documents/The Lord of the Rings Online/ui/skins/"
- Inside this "JRR Skins collection" folder, delete all the folders present, except JRR CORE. Based on the toolbar from "GreySkin UI" v.4, by Maximoz. - I just installed JRR and Greyskin and selected one of the skins on my character, some panels are displayed in a strange manner, like upside down. If only a few elements are greyed, this can be a error from my side (indicating a wrong location of a file in the skin). Don't hesitate to report me this kind of issues. If a big amount of gray frames occurs, first ensure you installed the JRR skins pack at the right location on your hard drive, then ensure you installed the "JRR addon - GreySkin" folder side by side with the "JRR Skins collection" folder. - My bags have no more borders neither their title bar with the big bag icon. This is not a bug, this is a skinning choice. If you consider this disappointing, not handy or ugly, you can use a bags replacement plugin, as HugeBag, it is amazingly convenient and good looking ! Advanced users can choose to revert it by deleting the whole "Ultra Mini-packs" section in the skindefintion.mxl file of every skin they wanna fix, and repeat this operation after every Greyskin update. - The map is no more full screen ! In fact this displays the map in this actual size, without the zooming blur. Advanced users can revert it by deleting the "Map Window" section in the skindefintion.mxl file of the used skin(s) profile(s), and repeat this operation after every Greyskin update. - My character doesn't show in the dress room ! If you run Lotro with a resolution height equal to 768, you have to play in full screen mode to get the dress room correctly displaying the character. Higher resolutions allow to play indifferently in full screen or windowed modes. If you run Lotro with a resolution height equal to 768, you have to play in full screen mode to get the auction house panel entirely displayed and usable. Since Rohan, Turbine bugged the toolbar code, then you now have to edit the "Y" value of the toolbar code in addition of its "X" value. These files are located in the Greyskin skins profiles folders (gray and black). You can open and edit them with Window's Wordpad or any else text editor software. I you play in window mode or switch between window mode and full screen mode, you can bypass the "Y" issue by simply setting the toolbar scale to a value different than 1.00 ( in lotro option panel -> UI settings tab) (0.99 or 1.01 is ok). - update contents are logged in JRR Skins Collection when there is no very specific fixes or content to mention. This update re-enables the toolbar's slots banks switching buttons(sword, shield and horse icons) on custom toolbar. Version 5.17 - December 23 2015 New major version ! - Grey toolbar profile now features the full same UI theme than "Fifty shades of Grey Wizard", which is the JRR revival of Greyskin UI. - Grey toolbar profile is still embedded wih the same translucent black default JRR UI. - Slightly redesigned the grey toolbar. - Level text indication on xp bar bar is turned off on both toolbars grey and black. - I have re-aligned auto attack button and fervor pips. - Bank switching buttons are disabled/hidden. - This update is just a patch to customize the new 4 bags greyed icons introduced with Update 13. - I've extended the crafting Panel, the Legacy Extraction Panel, and the Legendary Item Dismantling Result window. - Reworked the quest log main bar to fix many French and German minor localization issues. - Fixed many minor German localization issues on auction panel. - Re-worked the color bars from the stable master's travel panel. - Changed the backpacks inventory background and borders. - Requires JRR v4.7 installed. - Fixes a bug introduced in v2.6 which was blocking the display of the master loot window and need/greed/pass window, my apologies for this. - Fast fix for update 9. -Requires JRR v4.2 or above installed. 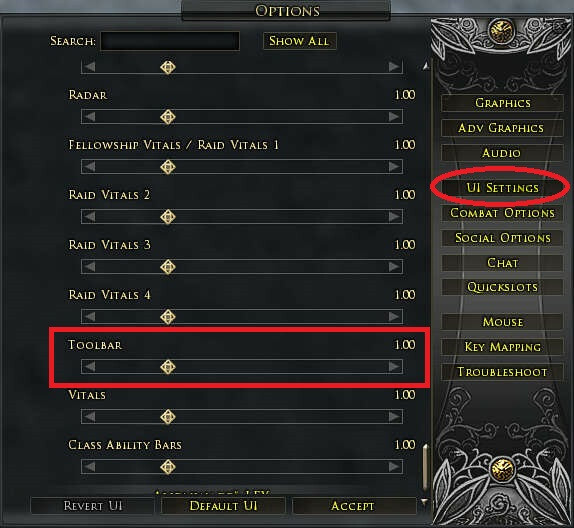 - Known issue : You will have to set the toolbar scale to 1.01 or any other size than 1.00 (in option panel -> UI Settings) to get the skills and buttons clickable ! -Requires JRR v4.0 or above installed. Please delete any previous installation of JRR and its addons before installing version 4. - Now supported by LotrOnion (Refer to JRR v4.0 release notes for further informations). -Requires JRR v3.2 or above installed. -Adjusted the position of the xp bonus meter. - Fixed a display issue (undesired text title) on bag 6. Lotro store button removed, main menu set compact, 3 button slots added. Highlight circle around bags is disabled. - Requires JRR v2.8 or above installed. Some fixes for the Lotro's 5th anniversary happy UI breakings. - Requires JRR v2.0 or above installed. - Integrated JRR v1.8.1 new features. - Require JRR v1.8.1 or above installed. - Extended a bit Black edition toolbar to reach the bottom of the screen. - Integrated JRR 1.8 new features. - Require JRR v1.8 installed. - Toolbar's partial transparency removed to optimize new icons integration. - Initial release (as JRR addon). - The original code, dated from 2007, has been rewrote. - Compared to original release (Greyskin UI 4), you can now freely assign the 9 first buttons to the features you desire. In addition, a "STORE" and a "MENU" buttons have been integrated. You can receive an automatic email notification on each new release of this addon. - Fixed many minor german localization isssues on auction panel. PS : The installation instructions logged on this page were outdated, this is now fixed. Last edited by Adra : 07-26-2013 at 07:38 PM. Last edited by Adra : 04-21-2013 at 08:16 PM. - A bug introduced in v4.6 was blocking the display of the master loot panel and the need/greed/pass window (present in non-scalable instances), this is now fixed, thanks to DaBear78my for reporting me this issue and my apologies for it. Last edited by Adra : 04-21-2013 at 09:18 PM. JRR Greyskin addon - Riders Of Rohan - edition is released ! Last edited by Adra : 10-28-2017 at 02:36 AM. - Requires JRR v4.0 or above installed. Please delete any previous installation of JRR and it addons before installing version 4. Hi, and thanks for the kind comment. The dress room embedded with Greyskin is the same than with the others JRR skins. The issue you describe usually occurs when the height of the screen is inferior to the height of the dress room (760 pixels). If you're running 1366x768 make sure to play in full screen, else you have not enough height available in the Lotro Window. For low resolution screens, you can use JRR SmallBar addon on "SmallBar No-ext" special profile, which has no extended panels. Last edited by Adra : 09-13-2012 at 03:58 AM. I was expecting one of those wonderful dressing rooms that comes with all your skins but this one is empty. Just a box and all of the proper buttons for custom dye and such. There is no character inside of the box. I've had a couple others lately the same. I must have something wrong. Other than that everything seems wonderful. Good job as usual.